Having narrowly escaped the police in Monaco, John Robie flees to Cannes in a motor boat with Danielle Foussard. Once in Cannes, he slips into the water and casually swims to the beach (while a police airplane circles above). The beach is directly across the main boulevard (La Croisette) from the famous Carlton Hotel. 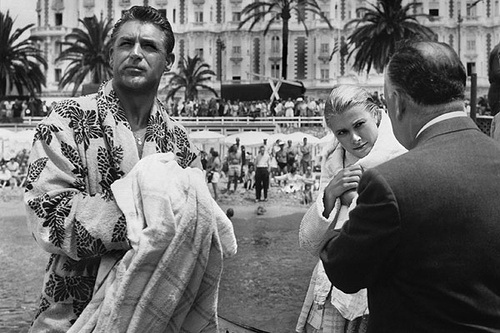 The Carlton plays a prominent role in To Catch A Thief, but more on that later. 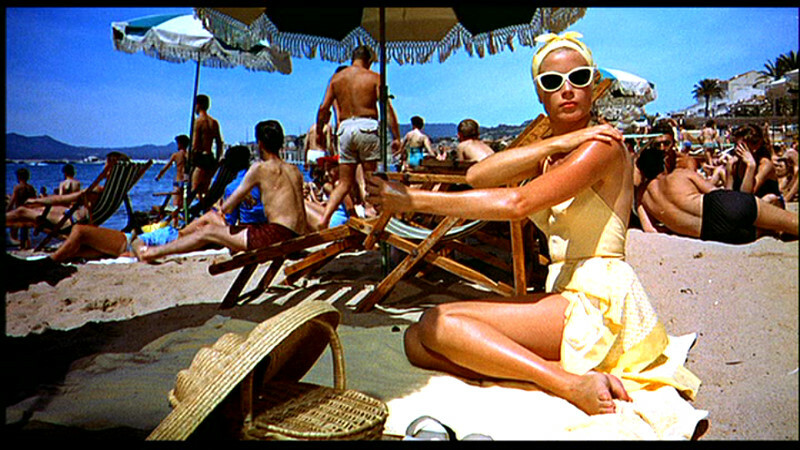 It is here, on the beach, that we get our first glimpse of Grace Kelly. If there has ever been perfect casting in a movie, it may be Grace Kelly for the part of Francie Stevens. Icy cool and strikingly beautiful in a yellow swimsuit and sunglasses, she notices Robie immediately. If you want to follow in Grace’s footsteps and lounge on the beach in Cannes you’ll first need to pay for a room at The Carlton. Only guests are allowed access to the private beach. Grant, Kelly, and Hitchcock in Cannes. Next stop, the Nice Flower Market…. Old world glamour at new world prices. Expensive, understated (some say overrated), but if you can afford it, do it. The Carlton is the place to stay in Cannes. If you fancy having a go at the film festival I suggest you reserve your room well in advance. The Carlton is ground zero for celebrities and movie execs during the two week fete.